How much $ for a tooth? I gulped when I looked down at my phone. My mother-in-law was calling me. No, she isn’t one of those mother-in-laws to fear, but she watches our little boy while we’re at work. Something may be wrong. I answered the phone nervously, not sure what I was about to hear. And I wasn’t prepared for it either. Yes, that loose tooth who had been clinging so stubbornly to our little boy’s gums had finally given up and came out while he was at art summer camp. The camp is only two hours long, but apparently some of the older kids in there had convinced him to stop wiggling the tooth and just yank it out. Sure, it was the same advice his mother and I had given him, but we’re not as wise and seasoned as third graders apparently. I called my wife to ask her and wasn’t surprised to learn that she had already been asking everyone on Facebook how much she (is the Tooth Fairy a she? I’m confused because of the amazing performances on screen of The Rock and Larry The Cable Guy) leaves. We weren’t sure and to complicate matters, our little guy had just gotten his allowance taken away for the week for not cleaning up his toys. He’s a stubborn guy. He takes after his mom I think. 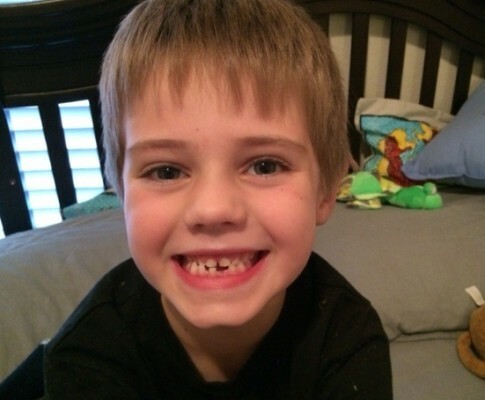 So, should the Tooth Fairy still leave money for Jack after he had his allowance taken away from him? Hmmmm … I did not envy that Fairy’s decision. Somewhere, along the way the Tooth Fairy decided on a price. Ironically, it was the same amount as he would have gotten for his allowance - $5, with a promise of a $1 per tooth from here on out. Ironically again, that was the consensus among those who posted on my wife’s Facebook page. The Tooth Fairy must be socially active too. Who knew? So what do you all think out there? Did the, ahem, Tooth Fairy make the right decision or is she as much of pushover as our son’s parents? Learn more about caring for your child's teeth here. Jeff Calaway is the Information and Publications Specialist at Cook Children’s and a contributing writer to this Web site. Jeff is a husband and father. He loves running and Bruce Springsteen, although not necessarily in that order. The tooth fairy always left my sister and I rare currency. We would get 2 dollar bills, half dollar coins, and dollar coins. We had some special occasions where we would get a larger sum. The largest ever reciveed was a$20 bill for three extracted teeth with extremely long roots. If I was grounded I would still get tooth fairy money. I Wouldn't give the allowance to him because his expectation will be if I get grounded, I can pull a tooth and get my allowance. I know thats what I would of thought as a kid! I really coveted the 2 dollar bill when I was a kid Jessie. I spoke to someone the other day who gave their child a $20 after their child needed surgery to remove teeth. For pain and suffering, right? I think the tooth fairy made the perfect decision for your family. Your son will only lose his first tooth once, so I believe it's worth celebrating. When my oldest child noticed her first loose tooth, I went to the bank and got a roll of gold dollars. That's what the tooth fairy leaves and it's lasted through all three of my oldest babies! I have found that when the tooth fairy leaves a regular paper dollar, that gets put in with other money towards a lego purchase, but when she brings a gold dollar coin, that is saved and viewed as more special. I like that. I think the tooth fairy will continue to bring golden dollar coins. How much does the tooth fairy pay these days? That's the question today. What did she leave for your kids?